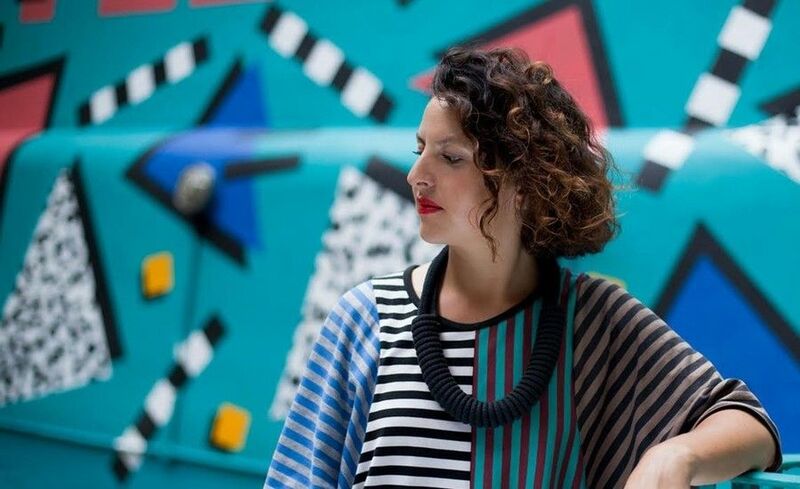 North Point might not be the first place you'd go in Hong Kong for street art, but from January till mid-May 2019, the neighbourhood is getting an injection of colour courtesy of London-based French artist and designer, Camille Walala. Known for her "tribal pop art" of bold graphics and coloured patterns, Camille is heavily inspired by the '80s design movement known as Memphis. Since designing the interiors of a nightclub in East London as her first project, she's applied her playful designs to buildings in London, New York, Mauritius, Melbourne, Tanzania and now, Hong Kong. Camille first visited Hong Kong in 2014 for a project with Lane Crawford, and now she's working on a 54-metre long mural for WORFU, a shopping arcade formerly known as Provident Square in North Point. My style of art is tribal pop, [with] a lot of influence from really colourful patterns. In general, I really like African patterns [that are] really graphic. What I'm trying to do is bring a sense of joy and happiness to the neighbourhood, which hopefully will work here. I love Hong Kong. I love all of these crazy tall buildings. I was really inspired when I first arrived here—it's a very colourful city. I'm inspired by the architecture of Hong Kong—I just love the buildings and the colours you can see. The markets, the little details like the kindergartens, the fruit shops—all these mundane details are an inspiration for me. From start to finish, a project usually takes around six months [to complete]. My proudest work is probably the first building I ever painted in London. People reacted amazingly and it created this sense of pride in the neighbourhood. I'm inspired by strong women painters, even those from the 1920s like Sonia Delaunay. I think she's my favourite painter. My next project is a big installation in the States, but I can't really tell you much more (yet). My ultimate dream would be to paint a total neighbourhood. Like, if I could do 10 buildings at a time, I would love that. Camille Walala's WORFU banner is open for public viewing from January 14-22, 2019 during the live installation and from January 22 to mid-May 2019 once completed. Tag #WORFUxWalala and @camillewalala on Instagram to join the conversation.